This paper is devoted to high-order numerical time integration of first-order wave equation systems originating from spatial discretization of Maxwell’s equations. The focus lies on the accuracy of high-order composition in the presence of source functions. Source functions are known to generate order reduction and this is most severe for high-order methods. For two methods based on two well-known fourth-order symmetric compositions, convergence results are given assuming simultaneous space-time grid refinement. Herewith physical sources and source functions emanating from Dirichlet boundary conditions are distinguished. Amongst others it is shown that the reduction can cost two orders. On the other hand, when a certain perturbation of a source function is used, the reduction is generally diminished by one order. In that case reduction is absent for physical sources and for Dirichlet sources the order is equal to at least three under stable simultaneous space-time grid refinement. Verwer, J.G. (2010). 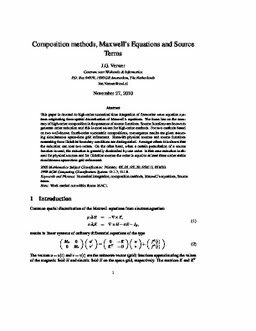 Composition methods, Maxwell's equations and source terms. CWI. Department of Modelling, Analysis and Computing [MAC]. CWI.